The Yacoubian Building, Rough Draft Festival 2018, LaGuardia Performing Arts Center. Dr. Alaa Al Aswany’s bestselling Egyptian novel The Yacoubian Building was published in Arabic in 2002 and voted Best Novel for 2003 by listeners to Egypt’s Middle East Broadcasting Service. It’s been translated into 23 languages—the well-received English translation by Humphrey Davies appeared in 2006—and was adapted to film in 2006 by Marwan Hamed. Catherine Coray (CC): How did you first encounter The Yacoubian Building? Did you first read the book, or see the film? Kareem Fahmy (KF): I’ve been working on a project (working title: The Triumphant) about the gay community in Egypt for a few years now and nearly two years ago I was talking about that project with someone who suggested I read the novel, as one of its many narratives involves a gay relationship between two Egyptian men. While on a retreat with New York Theater Workshop I read The Yacoubian Building as research for that project and fell in love with it. I knew instantly it was something I wanted to develop for the stage. I was lucky enough to get the option. CC: Is it a story that your Egyptian family embraced—or not? What do you know, aside from what we can read online, about the reception in Egypt to the book and the film? CC: What made you feel that this was a story that needed to be told onstage? Is there a particular theme or relationship you felt you could better illuminate, or an audience you felt you could better reach by adapting it to the stage? KF: Much of my work over the past few years has been about creating a deeper canon of plays about the Middle Eastern experience. I want to create a myriad of opportunities for Middle Eastern actors, directors, and designers. My adaptation of The Yacoubian Building features roles for 13 Middle Eastern actors that run the gamut from young to old, comedic to dramatic, supporting to leading. A key impulse for creating the work was to showcase the tremendous depth of Middle Eastern acting talent we have in this country. But even more, I wanted to create a play about Middle Eastern life that was not filtered through a Western lens. This a play about Egyptian people living in Egypt, written by a prominent Middle Eastern writer and adapted by a Middle Eastern theatre artist from the west. I think there’s tremendous value in putting that work on an American stage – it puts the Middle East and America in a conversation with one another in an immediate and tangible way. I also felt that many plays that I had seen or read about Egypt only deal with a small facet of Egyptian life, while this play – in its vast, epic scope – is about all of Egyptian society. CC: Were there any aspects to the story told by Al Aswany that you felt were missing from the film adaptation and chose to highlight in your play? KF: I’ve not seen the film and chose not to until I’ve completed my adaptation. I know the film is – like the novel – beloved, but ultimately, it’s another adaptation and I didn’t want those choices made by the screenwriter to influence my approach to the play. Theatre and film are such different mediums and I wanted to make something that was innately theatrical. I also wanted to retain my own imaginings of the characters and the way they speak, move, and behave as opposed to having the picture of the film actors in my mind. CC: Is there anything you are especially eager to illuminate for an English-language/US/”Western” audience about Egyptian culture by presenting this story onstage? Do you feel it’s a timely story, re: the social and political situation in Egypt? KF: So much! Mainly it’s demonstrating the breadth of Egyptian culture. This story has characters ranging from very poor to fabulously wealthy, strictly secular to devoutly Muslim, gay and straight and somewhere in between, fierce independent women, Coptic Christians, foreigners who have found themselves living in Egypt, etc. It paints a very broad portrait of life in contemporary Egypt and demonstrates the conflicts between the individual and the regime that led to the Arab Spring. What I’ve found most compelling about working on the adaptation is how closely the issues faced by the characters in the play mirror those we are experiencing in America. One of the central characters, Busyana, is a young woman who is being continually sexually harassed by her employer. It’s fascinating to look at this character’s journey through the lens of the #MeToo movement. And because here in America, many of us are experiencing a huge disconnect between our personal morals and values and what we see happening at the level of government, the growing friction between individual and society that is at the heart of The Yacoubian Building feels eerily familiar. CC: Can you envision taking this play to Cairo, in English, and/or in an Arabic translation? KF: One specific “instruction” that Dr. Al Aswany mentioned through his representatives when I enquired about the rights to the novel was that the adaptation be created expressly for an American audience. He wanted the play to speak to an audience that was largely unfamiliar with the novel or the film. That’s been in the forefront of my mind as I worked on the stage adaptation and it has predicated many of my choices. 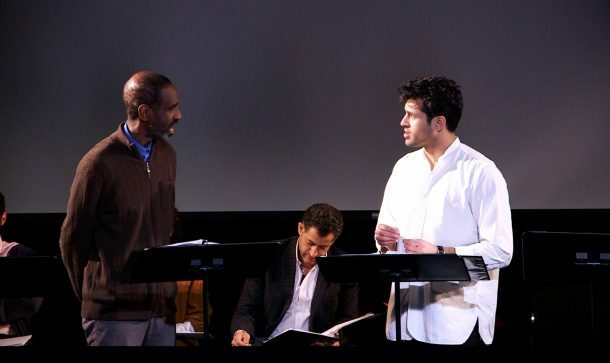 Ultimately it’s a play that I would like to see all over the world, including in Egypt, but I believe some work would need to be done to not only to translate my adaptation to Arabic but to manage some of the “cultural translation” I’ve needed to do to make this play for an American audience. What’s exciting to me about bringing the play to Egypt would be for this beloved work be seen by an audience that implicitly understands the cultural norms that I sometimes have to tease out and make more explicit for a Western audience. CC: What were some of the challenges in making the material accessible to a non-Egyptian audience—for example, cultural/political/religious/civic references that are particular to life in Egypt and/or the Arab World? KF: The biggest challenge has been what I like to think of as a “cultural translation.” There are aspects of the book – mainly the depictions of certain female characters, and one of the gay male characters – that are very much told from an Egyptian point of view which, by American standards, can feel somewhat reductive or simplistic. My work in adapting the book into a play is to make those characters more nuanced and fleshed out than the book allows them to be, despite spending less time with them than we can in the book. I also think there some behavioral norms that will read as “foreign” to a Western audience that I’ve chosen to retain because I didn’t want to make the storytelling “universal.” This is a story that’s rooted in Egyptian culture, and certain aspects of that culture will feel distanced from an American audience, but I hope that in seeing the play they’ll be curious to understand more about Egyptian culture. CC: What was the role of your dramaturg, Salma Zohdi, at this stage of the play’s development? KF: Salma has been instrumental in the play’s development. She knows the source material like the back of her hand, including the film and the television adaptation. She knows these characters on a very deep level. She has a keen eye for each character’s arc and has helped me immensely in how I’ve shaped their journeys through the story. Also, she understands the cultural norms much better than I do in that she grew up in Egypt. CC: What more did you learn about the text from working with the actors and presenting the recent staged reading in LaGuardia Performing Arts Center’s Rough Draft Festival? Are there any new directions you are considering as you move forward with the play? KF: Rough Draft was very illuminating. It was the very first reading of the play, and much of it is still very rough (as it were), so it was useful to see what plays well in front of an audience and what doesn’t. Mainly I realized that the physical life of the characters carries a tremendous amount of storytelling. This is subtextual stuff, behavioral stuff. What I learned is that it’s a play that needs to be fully physicalized to work. Hearing the text and the character arcs was useful, but the next step will involve honing the text while exploring the physical dynamics in the play. The two things are intimately intertwined. I also learned that there’s another character in the play: the building itself. The set of this play is hugely important. We had a rendering of the set created by the brilliant scenic designer David Esler, which was helpful, but I’m eager to get a production where we can explore a scenic design that allows the various intersecting stories of the play to overlap in space. CC: The LPAC Rough Draft Festival, curated by Handan Ozbilgin, seems a wonderful opportunity for the development of new work. What do you feel is special/important about this initiative? KF: Freedom. It’s a truly artist-driven experience. Handan and Scott Davis really let Salma and me lead our own process. I was able to present exactly what I needed to present at this point in the play’s development. That type of approach, where an institution is not dictating a methodology, is tremendously freeing for an artist. Catherine Coray has been on the faculty of NYU Tisch School of the Arts since 1991, and teaches and collaborates with artists in Austria, Belarus, Chile, Cuba, Egypt and Lebanon. She also teaches at NYU in Abu Dhabi and in 2016-17 served as the interim Director of the NYUAD Theater Program. Previously, she was the director of hotINK at The Lark, which introduced New York audiences to new plays from over 50 countries; she now is the Program Director for The Lark Middle East-US Playwright Exchange. In 2014, she curated In the Same Room, a conference of Middle-Eastern women in theater at the NYU Abu Dhabi Institute in NYC. 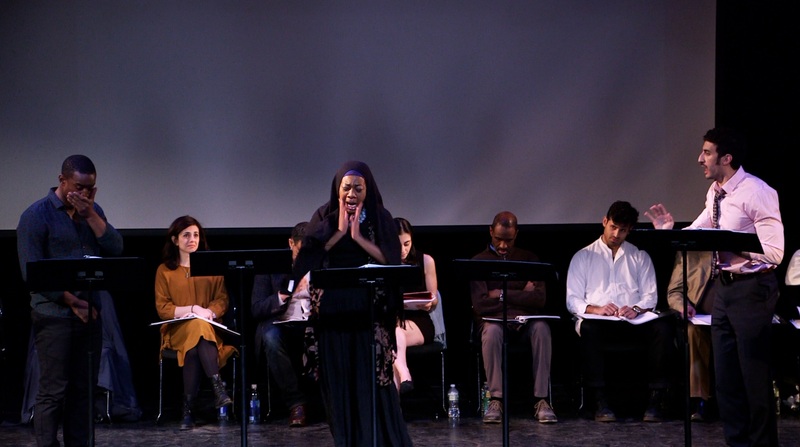 She also convened the 2016 Middle East America gathering at The Lark, and in November 2016 produced a festival to take place at the NYU Abu Dhabi Arts Center in November 2016 called Arab Voices: here/there/then/now. 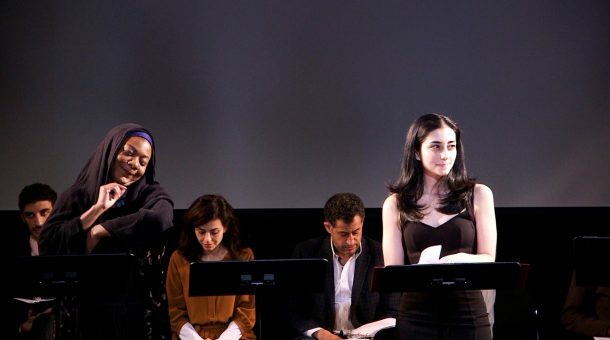 In March she curated and co-produced Arab Voices: Stories of Palestine, which brought together three Arab-American playwrights with Lebanese and Palestinian actors to introduce their work to Beirut audiences at Dar el Nimer Center for Palestinian Art and Culture. Catherine is a member of The Lark Artistic Cabinet and serves on the advisory boards of The Mercurian translation journal, The Laboratory for Global Performance and Politics and Arab Stages. Watch the video recap of Arab Voices: Stories of Palestine here!